We asked Professor El Afandi a few questions about his work, his teaching style, and what he likes to do in his free time. Here's what he had to say. 1. Sharing experiences with my students and colleagues. 2. Enhancing the ability of students to achieve their best. 3. Biodiversity and interacting with many cultures. 4. Introducing hands-on training for students to enhance their skills. Therefore, they will be able to innovate new tools and techniques. 5. Helping students to think independently and not accept my opinions all the time. 1. Think deeply in subject matter. 2. Concentration during my class. Enhancing STEM programs and more environmental and scientific research. It was a new FIAT car. This car ran great and was economical on gas! I would hire more graduate students to execute more research, especially in the area of renewable energy, and I would enhance the climate change program at CAENS. 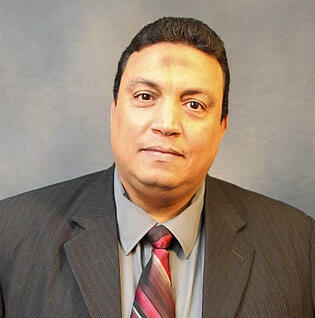 Dr. Gamal El Alfandi is an Assistant Professor of Environmental Sciences. To learn more about Dr. El Afandi's research and classes, visit his Tuskegee University faculty page.